The LF leader also urged Suleiman and Mikati to file a complaint with the Arab League and the United Nations Security Council against the Syrian regime’s plan to cause strife in Lebanon. 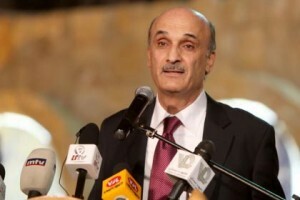 Geagea also reiterated that Hezbollah was behind the kidnapping of Syrian nationals in Lebanon and called on Suleiman and the cabinet to give orders to the Lebanese army and security forces to find and release the abductees and to punish the abductors. Suleiman said on Saturday that Syrian President Bashar al-Assad should call him and explain the transfer of weapons from Syria to Lebanon in the car of former Information Minister Michel Samaha. Wasn’t Geagea kept in a basement by the Syrians for eleven years? it seems to me that might make him a bit biased. Not wrong, just biased. In 1994, four years after the end of the Lebanese Civil War, Geagea was tried for ordering four political assassinations, including the assassination of Lebanon’s Prime Minister Rashid Karami in 1987, and the unsuccessful attempted assassination of Defense Minister Michel Murr in 1991. He denied all charges, but was found guilty and sentenced to four death sentences, each of which was commuted to life in prison. Everyone seems to deny ‘all charges’ … but at least Geagea showed up for the ‘trials’. More than can be said for some others. HE IS CORRECT AND NOT BIASED , HOW WOULD FEEL IF YOU WERE LOCKED FOR 11 YEARS AGAINST YOUR WILL AND NOT KNOWING IF YOU WOULD BE ALIVE OR DEAD THE NEXT DAY ?? HE IS RIGHT GET RID OF HEZBOULLAH AND NASARALLAH NOW OR ELSE THERE WILL BE ANOTHER CIVIL WAR . However, I believe that HA is going to provoke a civil strife the minute Assad falls in order to justify their existence, but at the end they are going to be forced to surrender their arms once and for all. You have a thick brain, you will not learn a thing, never mind chinese. Your reply proves how off you are. FYI I am not an arab, I am only interested in ME affairs, since they are so intriguing and so dysfunctional. You and your friends never ceased to amaze me and as a sample no wonder why the ME is in such chaos. No lesson here, you constantly demonstrate your ignorance by avoiding to address the real issues so you embark on a non sense idea and you blab. Continue to play with your self dude. Remember, keep a list of names of ALL the hezbian creeps you can so that they may be dealt justice later. KEEP A LIST OF NAMES. Tripoli war going on now …. and it’s not even Friday …. Tripoli war going on now ….